Diamond Knives – AYO Technologies Inc.
AYO Technologies & Micro Star Technologies offer a wide range of Diamond knives for all your ultramicrotomy applications and requirements. We offer three solutions, new diamond knives, resharpening of any brand or type of diamond knife and we will also accept any and all brands and types of diamond knives for our exchange program. If you are not sure of what to order or how to order it, or perhaps require technical assistance or a written quote, please feel free to contact us at your convenience. Flawless Quality Guarantee Our diamond knives have an extremely sharp and perfect edge which cut flawless sections totally free of chatter, compression, striations or other imperfections. Each knife is made one at a time undergoing multiple tests. The sections are examined at high magnifications optically and with the TEM. With every knife you get a signed certificate of quality with the parameters of the final test. AYO Technologies & Micro Star stand by its unconditional and simple guarantee. Do not authorize your payment until you have tested & accepted your new or resharpened diamond knife upon receipt and are completely satisfied with its flawless quality. We do ask that you make a point of reporting anything within 60 days from receiving your knife. Diamond Knife Included Angles The standard included angle for all knife types is 45° which is suitable for most applications. Our diamond knives are also available with included angles of 35° and 55°. Knives with 35° reduce morphological deformation but the edge is more fragile. 55° is recommended for routine sectioning of hard or difficult to cut specimens. Exchange of Any Brand Diamond Knife All types of diamond knives from any manufacturer (including AYO Technologies & Micro Star), any age or size, are accept- ed in exchange for a brand new AYO Technologies at the resharpening price. The new knife will be the same size as the exchange. If you want to exchange for a different size, please inquire with us for accurate pricing. We would be pleased to send you an official quotation. Resharpening Service for All Brands Regardless of the knife’s manufacturer, age or size, any diamond knife is accepted for resharpening. It will be refurbished to the same Micro Star guaranteed flawless quality and the same angle and size of your original knife. If these standards can not be met, a new diamond will be set at no extra cost. Resharpened knives will be reset in their original boat and box or, if you request it, they will be mounted in a new AYO Technologies & Micro Star boat of your choice, and new wood case. 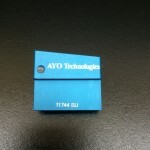 Your AYO Technologies & Micro Star diamond knife is suitable for an unlimited number of resharpenings. Our high precision equipment permits us to resharpen diamond knives by removing only a few micrometers from the diamond edge restoring it to its flawless original condition. This process can be repeated many times without affecting the diamond angle or edge length. 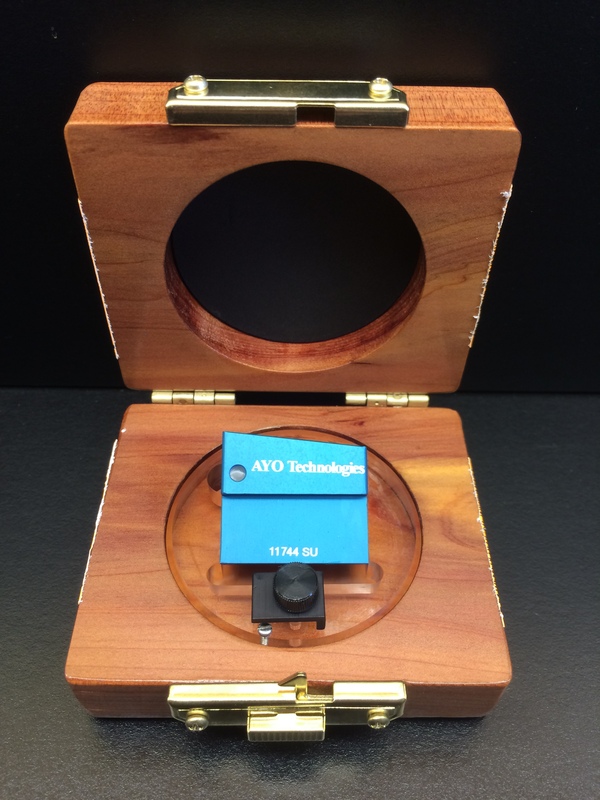 AYO Technologies & Micro Star, guarantees that your resharpened knife will be restored to its original new condition with the same original angle and length, or a new diamond will be set at no extra cost. Free services we offer, among other services, free diamond knife cleaning, evaluation and engraving. You may send us any old diamond knife for a free evaluation. We will clean, test, and measure it. If in need of resharpening, we will give you an exact quotation. We also evaluate specimens if you are not sure of their compatibility with diamond knives. Some materials are too hard or abrasive and will quickly damage the diamond. Our free evaluation and report will let you know if your specimen is suitable to be sectioned with a diamond knife. For sectioning of biological or materials specimens that will be inspected at the highest magnifications. Recom- mended for cutting sections with a thickness range from 25 to 200 nm. Available in diamond edge lengths from 1 to 6 mm. Mounted in boat style S or any other requested style. Wet For sectioning at cryogenic temperatures down to -200° C using liquids, like ethylene glycol, to float the sections. Recommended for cutting sections with a thickness range from 50 nm to 1 µm. Available in diamond edge lengths from 1 to 6 mm. Mounted in boat style W.
Dry For sectioning dry at cryogenic temperatures down to -200° C. Recommended for cutting sections with a thickness range from 50 nm to 1 µm. Available in diamond edge lengths from 1 to 6 mm. Mounted in boat style D.
For sectioning thick or alternating thick and thin sections. Recommended for cutting sections with a thickness range from 50 nm to 2 µm. Available in diamond edge lengths from 1 to 6 mm. Mounted in boat style S or any other requested style. For industrial materials sectioning, not tested to the same ultra high standards as the types above, hence its lower price. Recommended for cutting sections with a thickness range from 50 nm to 2 µm. Available in diamond edge lengths from 2 to 7 mm. Mounted in boat style S or any other requested style. Cryo Sectioning for light microscopy or histology applications at cryogenic temperatures wet or dry. Recommended for cutting sections with a thickness range from 0.1 to 5 µm. Available in diamond edge lengths from 4 to 7 mm. Mounted in boat style W or D for wet or dry sectioning respectively. 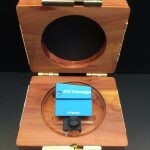 Sectioning for light microscopy or histology applications at room temperatures. Recommended for cutting sections with a thickness range from 0.1 to 5 µm. Available in diamond edge lengths from 4 to 7 mm. Mounted in boat style K, or other boat style upon request. All dimensions shown in millimeters. If you have a special use for a diamond knife requiring custom design, please contact us by phone or email with your specific requirement, specifications and application. We usually can accommodate those requests at no extra cost. Standard boat with oval cavity, black anodized. All knives are supplied in this boat unless otherwise re- quested. The exceptions are cryo knives, supplied in styles W or D, and knives with diamond edges from 7 to 10 mm which are supplied in style P.
For wet cryo sectioning. stainless steel with mate of non glare finish and cylindrical cavity. For dry cryo sectioning. Stainless steel non glare finish. Oval cavity boat. 6° inclined top. 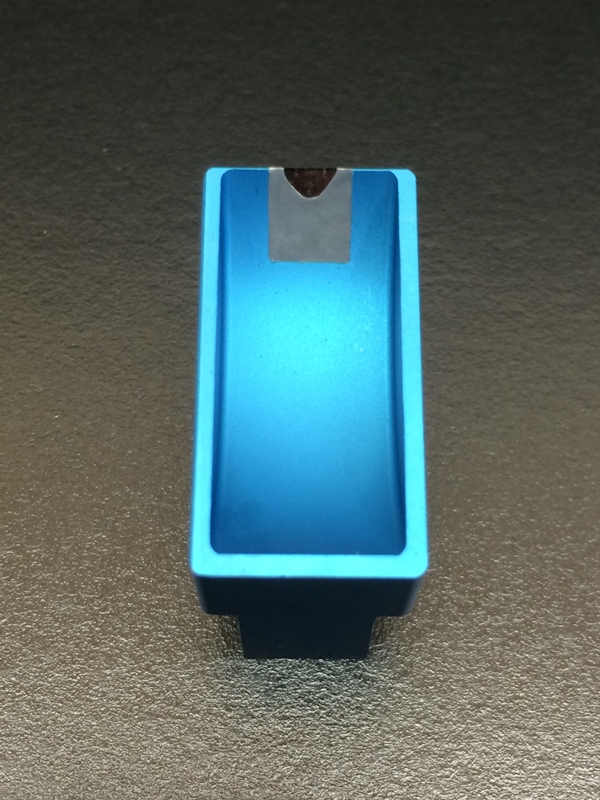 Available in non glare black, gold or blue anodizing. Cylindrical cavity, 6° inclined top. 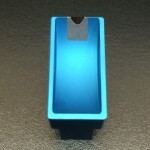 Available in black or non glare blue anodizing. Wide oval cavity boat. Black anodized. Narrow boat with deep cylindrical cavity. Black anodized. Large boat with cylindrical cavity and 6° inclined top, black anodized. Supplied with knives with edges from 7 to 10 mm long. All of our diamond knives are packaged and shipped in a hand crafted wood case. The protective case is designed and manufactured by Micro Star and distributed by AYO Technologies. Our wood case provides protection for shipping and storage as well as many years of practical and good use. Our wood case is sealed immediately after the final testing phase and should not be opened by anyone except for the lab staff who are required to inspect it. Due to the extreme sharpness of a diamond knife edge, it should not be touched or cleaned with any solid object. Put particular care in trimming the trapezoid base of the specimen block. Cut it with a new razor blade. Before sectioning, clean the block with a spray of distilled water, then blow the water away with clean compressed air. Clean the diamond knife after sectioning with an air brush spray of distilled water, then blow the water droplets from the diamond with clean compressed air or other gas. If sections or debris have dried on the diamond, use the DIAMOND KNIFE CLEANER with distilled water and a few drops of mild liquid detergent to remove them. Rinse with plenty of water and use the air brush spray as before. Do not wipe the diamond knife with a wood stick or any other solid object. Doing this repeatedly, will cause edge imperfections and hasten the time it will need resharpening. Do not use ultrasonic cleaners; some are very strong and may cause damage. Do not use acids, ammonia, or strong chemicals; they do not affect the diamond but will damage the metal boat or its finish. Chatter problems can be helped by: properly fastening the knife and block, slowing the cutting speed, using a well cured and narrow block and varying the clearance angle. You may send us a diamond knife for cleaning and evaluation, or send us a sample of a material to determine itscompatibility with diamond knives. You may request your name engraved on a diamond knife. These services are free of charge except for shipping. A diamond knife for ultramicrotomy is an extremely sharp and precise diamond blade mounted in a metal holder called “boat”. Diamond knives are used for slicing very thin specimen sections which are magnified with an electron or optical microscope. 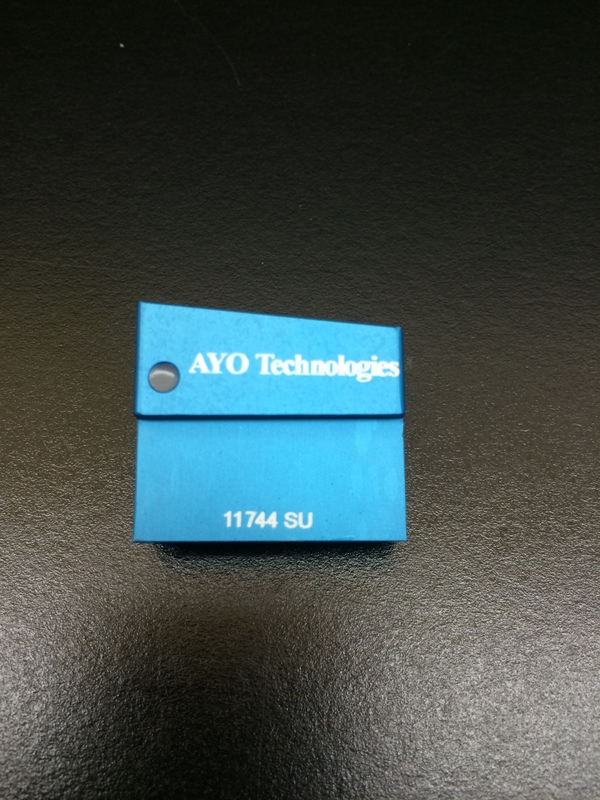 An AYO Technologies & Micro Star edge radius is about 2 nm or 12 carbon atoms. This molecular sharpness is needed in order to cut sections as thin as 25 nm. The sections are examined in the electron microscope at very high magnifications showing details sometimes less than 10 nm, and requiring the diamond knife to be defect free even at that scale. Making an AYO Technologies & Micro Star diamond knife involves an array of precision machines and sophisticated instruments. Each diamond passes a long series of manufacturing processes and more than 100 inspections and tests which, with the skill and expertise of our technicians, make possible the production of a flawless diamond knife. Our diamond knives are made from carefully selected, jewel quality diamonds. The crystals are cleaved along their natural lattice and microscopically screened to choose only the flawless ones. Each diamond is welded with a titanium alloy to a steel shank, forming a high strength molecular bond that insures knife stability during sectioning. A laser instrument is used to align the diamond along the exact crystal orientation that provides maximum edge strength and durability. Once the diamond is welded in the steel shank, it can be positioned precisely in the various machines and instruments that are required to produce the edge and test its quality. At every step, our knives are monitored with state of the art equipment to assure process control down to the molecular level. The optical interference contrast and scanning (SEM) electron microscopes allow inspection of diamond surfaces, orientation and welding quality. The transmission electron microscope (TEM) monitors the quality of the sections at various stages in the process. For the ultimate direct inspection at atomic scale (½ nm), the atomic force microscope (AFM) is used to verify molecular orientation and edge characteristics. After the polishing process, the diamond knife is tested by cutting gray and purple sections and inspecting every micrometer of the edge. Only if no flaw is detected is the knife allowed to pass to assembly. The diamond knife is assembled to the metal boat using a laser instrument to insure accurate alignment. The bonding agent is a very inert and insoluble encapsulating material. This allows the use of solvent solutions for cleaning without any danger of dissolving the encapsulating material. Our diamond knives undergo a process that makes the diamond hydrophilic. A hydrophilic encapsulating material is also used inside the boat. This attracts the water toward the edge making it easy to maintain the proper level and meniscus for sectioning. After a knife is assembled in the boat, an exhaustive new sectioning test is performed through the entire length of the edge. Each section is painstakingly examined for evidence of imperfections. Only if this final test also shows the knife to be flawless, it is approved for shipment, packed and sealed in its wood case. A certificate of quality is included with every knife indicating the parameters of the final test, such as resin type, speed,section thickness, etc. This is signed and dated by the microtomist performing the test. In the end, the only criterion that defines the quality of a AYO Technologies & Micro Star diamond knife is its performance in your laboratory. This performance is guaranteed in a very simple way. AYO Technologies & Micro Star request and encourage that you do not authorize payment until you have received and tested your diamond knife upon receipt and are totally satisfied with its quality. AYO Technologies & Micro Star have seven types of diamond knives and nine boat styles. For most ultramicrotomy applications the standard diamond knife (type SU) in the standard boat (style S) is totally satisfactory. For some applications, such as cryo or histology sectioning, you may want to choose a diamond knife and boat designed for that application. See our catalog for detailed specifications and dimensions, or call if you need help in choosing a knife for a particular purpose. There are two angles important in selecting and using diamond knives, the included angle and the clearance angle. The included angle is measured between the two facets that form the knife edge. The standard included angle in AYO Technologies & Micro Star’s knives is 45° used for routine sectioning. Optional angles are 35° and 55°. A 35° included angle is chosen when it is important to keep morphological deformation to a minimum. This reduced angle however, makes the edge more fragile. 55° is recommended to increase the life of knives used to section hard materials such as bone or non ferrous metals. Other included angles are available upon request and at no extra cost. The clearance angle is the angle between the back diamond facet and the block face in the ultramicrotome. Micro Star knives are built perfectly aligned with the back plane of the boat. This means that the actual clearance angle during sectioning is the angle set in the ultramicrotome adjustment. The suggested clearance angle, usually 4° or 6°, is indicated on the name plate and also on the quality certificate. Clearance angles may be set safely between 2° and 10° to adjust for materials or sectioning conditions. Larger than 10° would put too much stress on the edge and decrease its life. Smaller than 2° would make sectioning difficult and cause chatter due to the knife rubbing the block face. cause chatter due to the knife rubbing the block face. When using a diamond knife, keep in mind the extreme sharpness and perfection of its edge. Although diamond is the hardest material known, a diamond knife can only take advantage of this property when it is used in the microtome. Only in this instrument is the edge subjected to compression forces in the cutting direction alone. Any other time the knife edge is touched by a solid object it will sustain side stresses causing microchips that will show as lines or tears on the micrographs. When handling a diamond knife, utmost care should be taken to avoid touching the diamond edge with anything, be it a metal object or your finger or even tissue paper. Any accidental contact with the edge may cause damage and edge imperfections. When you are expecting your diamond knife, instruct the clerks in the receiving department of your institution not to open the box and handle the knife. Experience has shown this to occur occasionally, despite the warning labels on the sealed box. Our diamond knives are supplied in a sturdy wood case that provides excellent protection for shipping or storing. Proper techniques for specimen embedding and block preparation are very important to protect the knife from contaminat- ing particles that could damage the edge during sectioning. Examples are, glass particles from pipettes with broken edges, excessive OsO4 resulting in discrete crystallization, metal particles from razor blades used for trimming, etc. 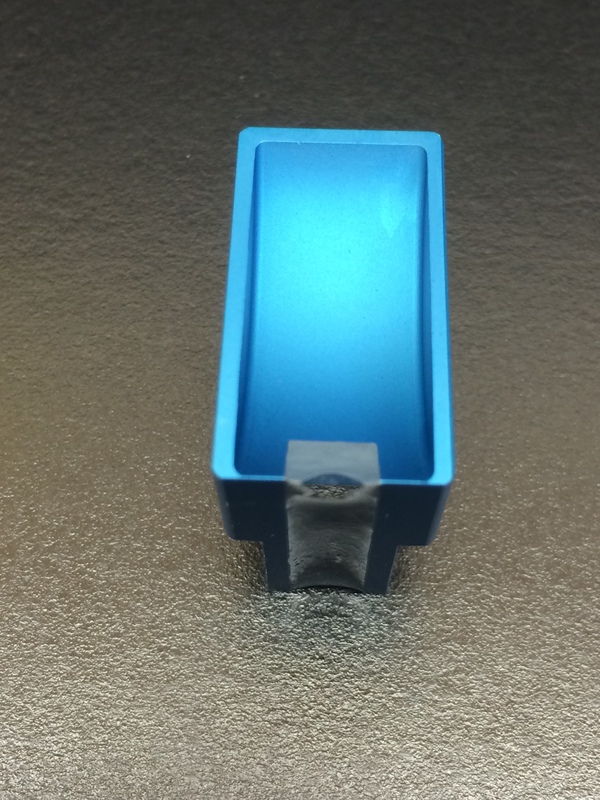 The plastic block containing the specimen to be sectioned is usually trimmed in the shape of a trapezoid. The base of this trapezoid is the first line of contact with the diamond knife edge during sectioning. Special care should be taken when trimming the block, particularly the trapezoid base. It is advisable to do the last two or three slices on this base with a brand new razor blade. An old blade with nicks and bends would be more likely to leave minute metal particles on the block which, acting as concentrated stress points, could cause chips on the diamond edge. For the same reason, the block should be thoroughly cleaned before sectioning since dust particles or debris, specially on the trapezoid base, could also damage the knife. Rinse the block with a source of pressurized distilled water spray like an air brush, then blow the water away (rather than dry it) with clean pressurized air or other gas. Water used for cleaning and sectioning should be distilled or deionized. Tap water contains various minerals in solution that are left as crystalline particles after the water evaporates. These particles, particularly on the base of the block, could be a source of edge imperfections. A clean diamond knife is important because debris on the edge may make sectioning difficult creating stress points and edge imperfections. The ideal cleaning method for diamond knives should not require touching the diamond with a solid object. It should be harmless to the knife, and yet effectively remove dry sections and debris. We have done considerable research to develop such a cleaning method. As a result we recommend the use of two devices. The first one is an air brush like the ones sold by hobby shops for spray painting small objects. For cleaning knives, use with distilled water and compressed air at relatively high pressure (80 to 150 psi). 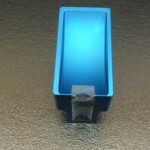 The second instrument is the DIAMOND KNIFE CLEANER which we have designed, and manufacture for this purpose. It is basically a magnetic stirrer that reverses direction twice a minute, with a timer adjustable to 8 hours. The Diamond Knife Cleaner includes a beaker and a special holder where a Micro Star or any other standard diamond knife can be clamped. Standard knives have a 3/8” (9.5 mm) wide base. The diamond knife is fastened, and placed inverted in the beaker containing 50 ml of cleaning solution. If you prefer to use a magnetic stirrer that you may already have in your laboratory, we also offer the beaker, holder and magnet as a separate kit. As a cleaning solution we suggest distilled water with 10% liquid detergent. Use a mild liquid detergent that does not contain ammonia or strong caustic chemicals. Ammonia degrades the boat finish. We have obtained good results with JoyTM (Procter and Gamble). Other liquids that may be used for cleaning and do not harm Micro Star diamond knives, or knives resharpened by us, are solutions of isopropyl alcohol or acetone up to 25% each in distilled water. The best approach to keep your diamond knife clean is to rinse it after each cutting session before the water in the boat dries and the sections and other debris adhere to the diamond. Spray the diamond with distilled water using the air brush and then blow the water droplets with compressed air or other clean gas. This is the primary cleaning procedure which many times will be sufficient to keep the knife clean. Often however, the water in the boat dries or retreats from the diamond allowing sections to adhere on the diamond. The longer they are left dry the harder they will be to remove using only the pressurized water spray. To remove dry sections use the Diamond Knife Cleaner. If the sections on the diamond are less than a day old, a short cycle in the cleaner should be sufficient, but knives with debris days or weeks old may need the full 8 hour cycle. After finishing the Diamond Knife Cleaner cycle, rinse the knife with plenty of water to remove all traces of detergent. Tap water is acceptable if immediately followed by distilled water sprayed with the air brush. Spray the diamond thoroughly and from various directions. Finally dry the knife with clean compressed air or some other pressurized gas. This blows the water droplets from the diamond rather than allowing them to dry which may leave residual particles. We have found that this procedure cleans 90% of the knives. The rest are usually knives that have been left with dry sections or debris for several months or longer. If you have some diamond knives in this last category, which you think are good but just need cleaning, you may send them to us to be cleaned and evaluated free of charge except for shipping. We have additional cleaning methods and equipment that do not involve touching the diamond with solid objects. Do not wipe a Diamond Knife with sticks or any other solid objects. This is recommended by other manufacturers and will certainly clean the diamond. We have found that doing this repeatedly will damage the edge and hasten the time you have to send the knife back for resharpening. Do not use ultrasonic cleaners. It is not recommended to clean diamond knives ultrasonically. Some ultrasonic cleaners are very strong and could damage the knives. Do not use acids, ammonia, or any strong chemicals. They will not affect the diamond but could damage the metal boat or its finish. As mentioned earlier, among the substances that may be used for cleaning and do not harm AYO Technologies & Micro Star diamond knives, or knives resharpened by us, are solutions of isopropyl alcohol, acetone and mild detergents with no ammonia. Lines and striations – These constitute the most prevalent sectioning problem and often the main reason a diamond knife becomes unusable and in need of resharpening. They are caused by chips and imperfections on the knife edge. Often these imperfections may be the result of poor handling and cleaning techniques. By following the suggestions of the preceding pages you may prevent edge damage and maintain the top performance of your diamond knife, sometimes for years. Before shipping, we thoroughly test every new or resharpened knife to verify that it is totally flawless.You can certify this in your acceptance test. On the other hand the fact remains that normal use of the diamond knife, sectioning various types of specimens, is going to contribute to imperfections. Certain kinds of materials are more prone to do this specially if they contain discrete particles or areas substantially harder than the rest of the material. A good example is a specimen fixated with excessive OsO4 resulting in discrete crystallization through the sample. Often by the nature of your work it may be unavoidable to section materials which may cause deterioration to the diamond knife. Occasionally, you may want to decide whether to section a material you suspect may be too abrasive. If you have an old diamond knife, you may be able to test the sample observing the effect it has on the old knife before you proceed to cut with a knife in good or new condition. An alternative is to send a sample of the material to us for evaluation. We have methods to determine if it is suitable for sectioning and will be glad to evaluate the material and give you a report, free of charge. Chatter – This is basically a mechanical vibration that shows on the sections as marks or wrinkles parallel to the knife edge. It may show only on parts of the section while other areas remain smooth. Sometimes a sound or vibration can be heard when chatter is occurring. In general this problem is not originated on the knife itself as evidenced by the smoothly cut areas, but is due to some mechanical problem such as the knife, block or microtome stage not being sufficiently secured. A poorly mounted or loose diamond would also cause chatter. Our diamond knives and the knives resharpened by us are metallically welded in their steel shank and are guaranteed for life not to become loose. Sometimes even if every part is secured, the cutting action produces chatter because the cutting speed is too high or the block is too wide. Other possible causes are external vibration or a block too soft because it is not sufficiently cured. Obviously the solutions include properly fastening the microtome parts, slowing the cutting speed, trimming the block narrow- er, and using a well-hardened block. Sometimes changing the clearance angle helps. Clearance angles between 2° and 10° are safe. An angle larger than 10° could put too much strain on the edge and damage it. Once chatter has started on a particular section, sometimes it is difficult to eliminate on following sections because it tends to be reinforced as the knife encounters previous chatter marks. To avoid this, turn the stage slightly to make the knife start a new cut toward one side of the block. The narrower new sections are usually chatter free. If the speed has been slowed and the mechanism is clamped better, the knife should continue cutting smooth sections. Compression – This is a related problem usually caused by a dull knife. It shows as lines or fine wrinkles parallel to the knife edge covering the whole section and giving it a frosty appearance. It is possible that only part of the knife edge is causing compression while the rest is still sharp; this will permit using the knife on the good area for a while longer. Otherwise the only solution is having the knife resharpened. Water does not wet the diamond. Our diamond knives are treated with a special process that makes the front diamond surface hydrophilic, but you may encounter the problem in old knives or from other manufacturers. If you have difficulty in making the water extend to the diamond knife edge as required for proper sectioning, there are some helpful techniques. One technique is to cut first a dry section, that will bunch on the edge (this will not harm the diamond). Then overfill the boat until the water contacts the section. Finally withdraw enough water to give the meniscus on the edge the proper shape. The following sections are usually cut without difficulty as the water stays at the edge by capillary action. Also, about 10% of a solvent can be added to the distilled water used for sectioning. This improves wetting without any danger of dissolving the bonding material of our Diamond Knives, or any other brand knives resharpened by us. Another solution involves the use of Photo-FloTM. This is a liquid surfactant made by Eastman Kodak. Use a sharp pointed tooth pick, to apply a thin layer of Photo-FloTM on the bonding material inside the boat, specially toward the upper corners on both sides of the diamond. Do not apply on the diamond itself or on the outside of the boat. Be careful not to touch the diamond edge. Then let it dry thoroughly. This procedure turns the material around the diamond hydrophilic, making it easier to draw the water to the edge of the knife. If you do not have access to Photo-FloTM, let us know and we will be glad to send you a small amount free of charge. Water jumps on the block – A water level too high, forming a convex meniscus, will cause this problem. If the water is al- ready low enough, the reason may be static charge produced during sectioning, specially if the air is very dry. Sometimes the water also wets the back side of the knife requiring that the block and the knife be dried before more sectioning can be done. Do not try to wipe the diamond; this would risk touching and damaging the edge. Dry the knife and block by blowing compressed air or other clean gas. To prevent this problem, some method to neutralize static electricity must be used. If the room environment is controlled, a relative humidity of 70% or more or an air ionizer will prevent static charging. There are also some hand held ionizers that can be used particularly during the winter when the ambient air is very dry. We normally maintain in stock some of the most popular sizes and types ready to be shipped the next day after you place the order. All other new or resharpened knives are usually shipped within ten days after receiving the order or the knife to be resharpened. We ship anywhere around the world using Federal Express Air or ground, UPS Air or ground or other freight forwarding companies. Orders usually arrive at your destination within 1 – 5 days A.R.O. depending what shipping method was used and where your destination is. Should you prefer or require for your order to be shipped by another carrier, we would be more than compliant with your request, as long as that carrier works from our area and willing to pick up the shipment. When shipping diamond knives to us, you may use: UPS, Federal Express, Airborne, Emery or Parcel Post. If you prefer a different carrier, make sure it delivers to either our AYO Technologies Canadian or USA Locations. Insure your knives for their trade-in or replacement value shown in the price list. We will honor it in case of a loss. For extra security, please do not use the word “ Diamond “ on any label or document attached to the outside of the box. If it is the first time you order from outside the Canada or the United States, please give us detailed information on the documents required by your country and institution to accompany the shipment. You are responsible for paying any fees such as custom brokerage and any applicable taxes related to your city, state, province, country. When shipping a diamond knife from outside Canada and the United States, describe contents as: “ Parts for Electron Microscopy ” or “ microtome knife “ property of… (your Institution’s name or company name)… to be returned after repair” or words to that effect. For customs declarations, use the trade-in or replacement value shown in the price list. Prices could be quoted in either US or Canadian Funds, F.O.B. AYO Technologies. Please indicate preferred shipping method and account number if the shipment is being billed to your own shipping account, otherwise you will be billed for shipping charges on your invoice. Prices quoted exclude sales taxes. Applicable taxes will be added to your invoice. Payment Terms are net 30 days from date of invoice once approved for billing. Visa & Mastercard orders are accepted and billing & payment processing will take place at time of order. When Placing an Order: Please indicate the brand and serial number of the knife that you are returning for resharpening or exchange, unless ordering a new knife. Indicate the boat style and color required.